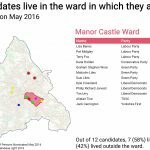 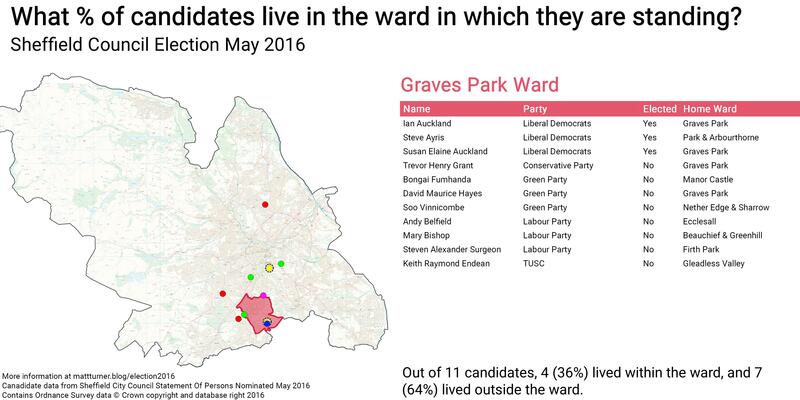 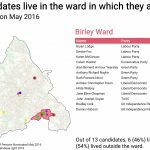 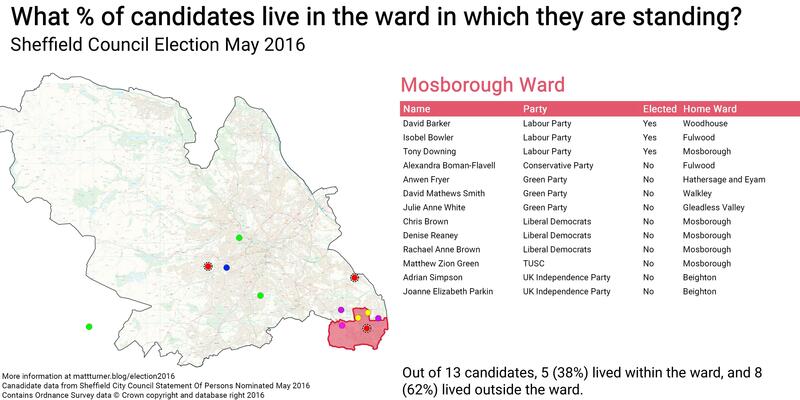 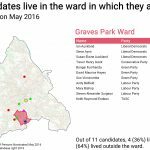 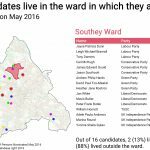 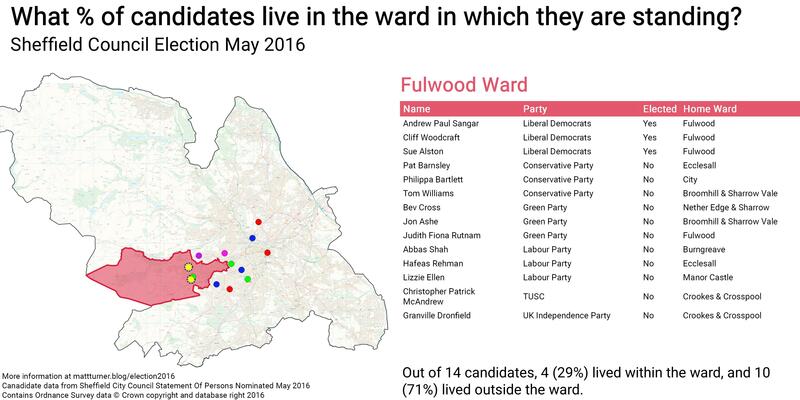 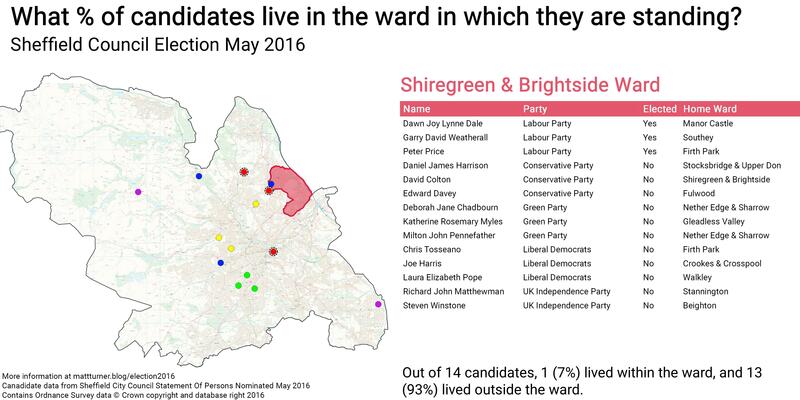 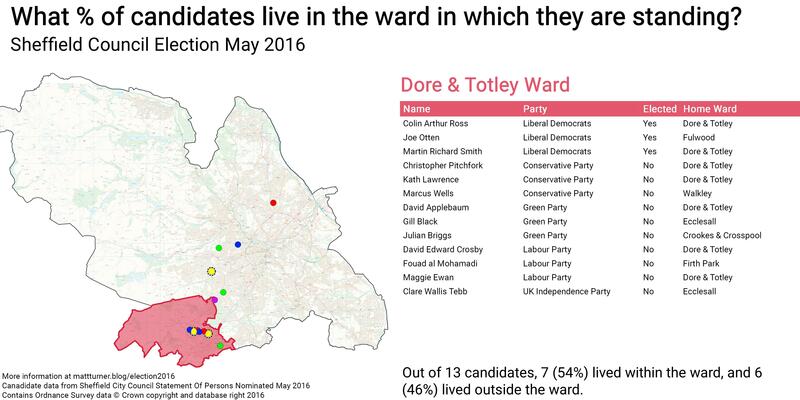 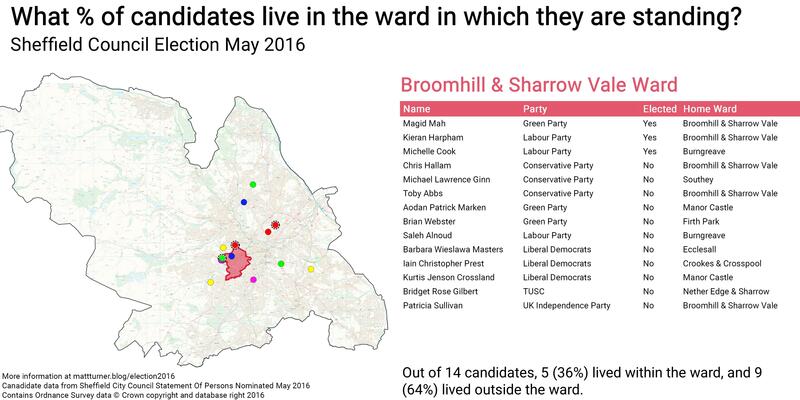 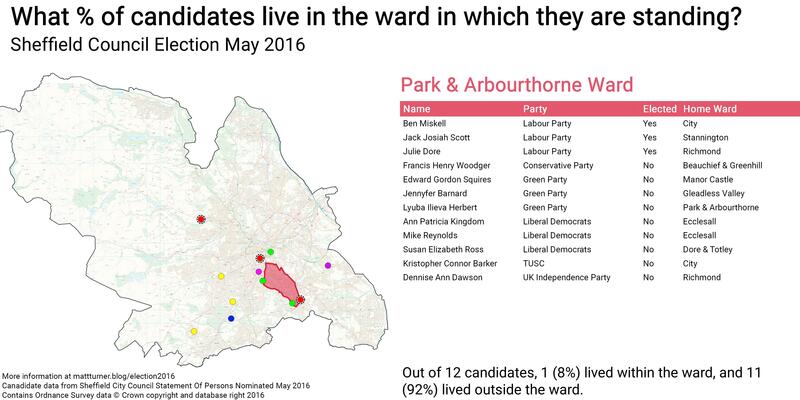 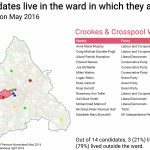 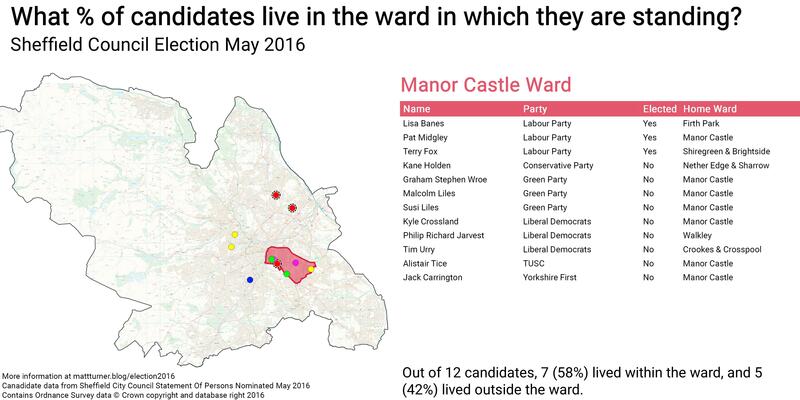 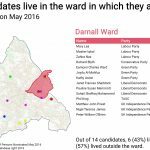 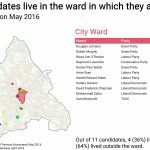 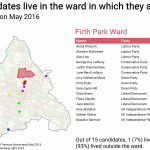 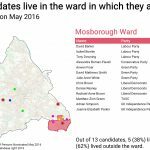 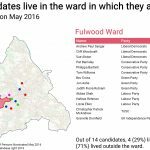 If you’re one of the 21,000 people who live in Firth Park Ward, then in the May 2016 Sheffield Council election, 13 of the 14 candidates you could vote for lived outside your ward. 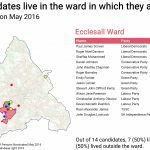 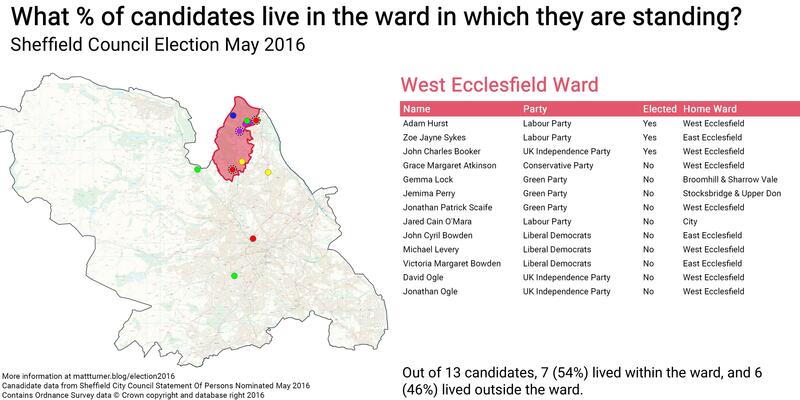 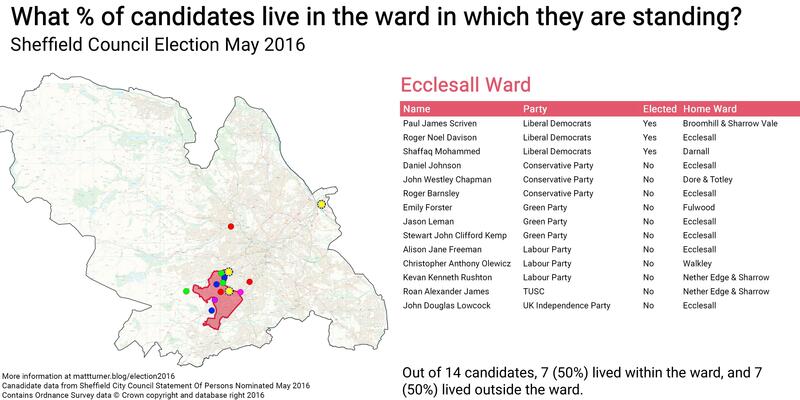 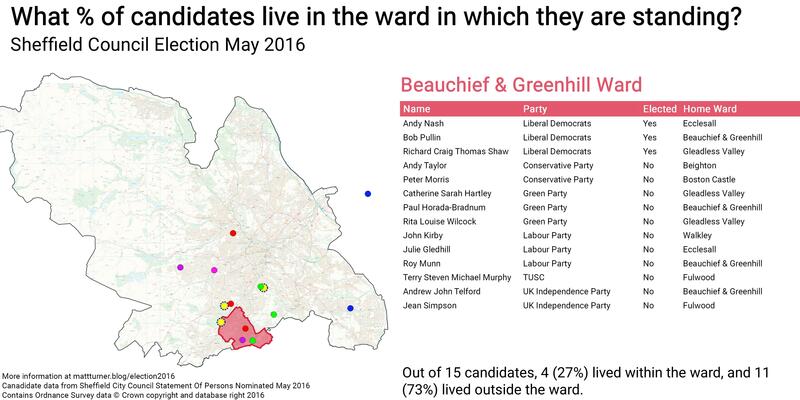 However, in a different part of the city, 71% of East Ecclesfield’s candidates lived within the ward. 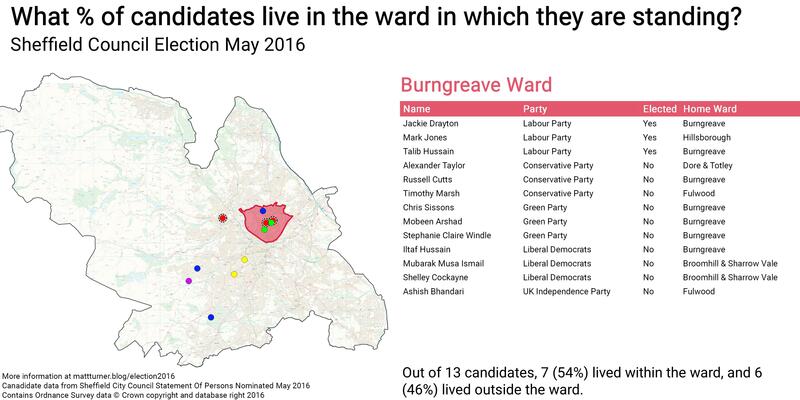 Across Sheffield the picture is varied, of the 372 candidates in 28 wards, 36% lived in the ward in which they were standing, 64% did not. 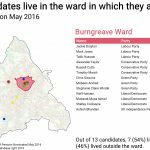 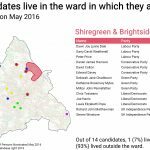 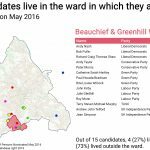 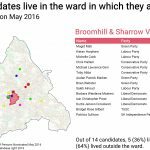 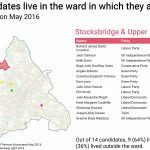 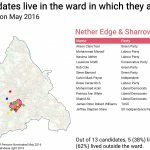 In this post I’m going to look at the candidates in the 2016 Sheffield Council election and try to explore some interesting information about the people who stand for election as local councillors. I’m not making any judgements about the results of this information, but I do think it’s interesting to see the disparity across different areas of the city and between the political parties. The data is from the ‘Sheffield City Council Statement of Persons Nominated May 2016‘, the maps were created using QGIS, maps for all wards are at the bottom of this post and in this Google Drive folder, I hope to make the source data available online soon. 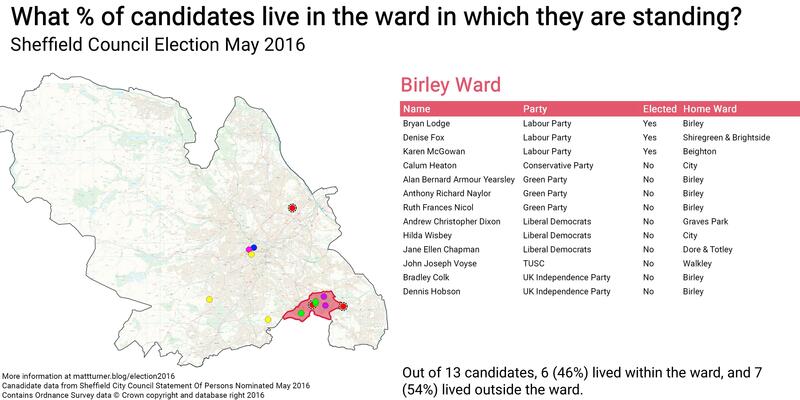 Sheffield has 28 wards which were recently changed as part of a boundary review. 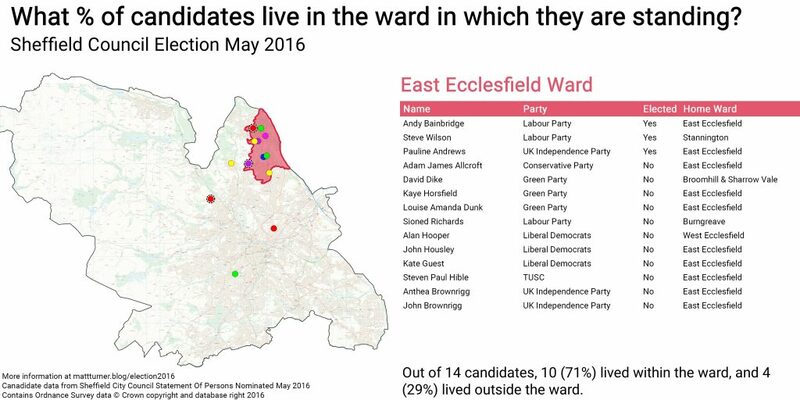 There are 3 seats per ward, usually one candidate is voted on per year, but in May 2016 there was an ‘all out election’ where 3 people would be elected to each ward in one election. 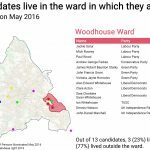 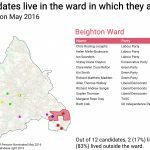 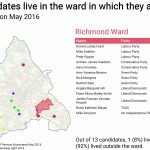 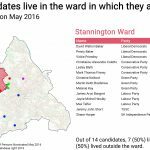 Do councillor candidates live in the wards they’re standing in? 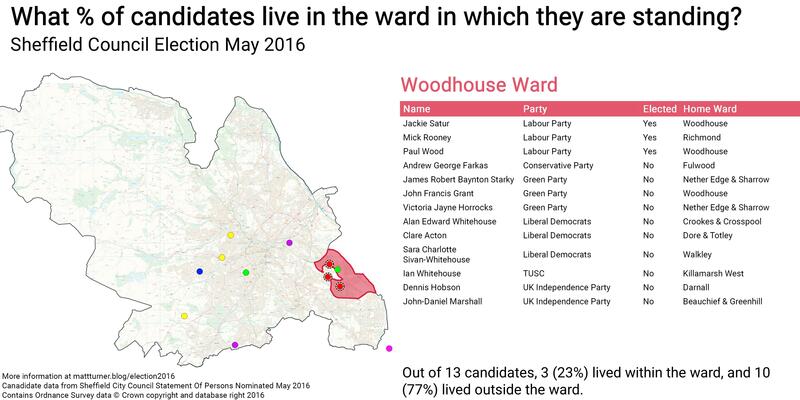 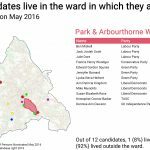 Of the 273 candidates, only 135 (36%) listed their home address as within the ward where they were standing, 237 (65%) lived outside the ward. 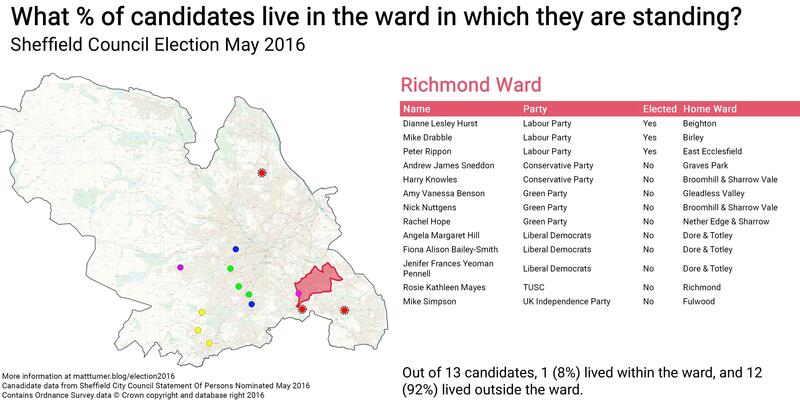 This varied across each ward, with Firth Park, Shregreen & Brightside, Richmond, Park & Arbourthorne Wards each only having one candidate living in the ward. 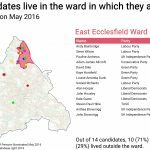 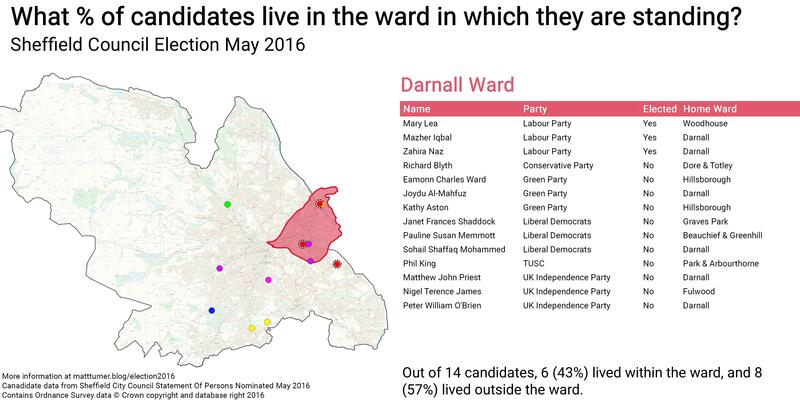 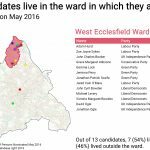 All the way up to East Ecclesfield ward where 10 of the 14 candidates lived in the ward (71%). 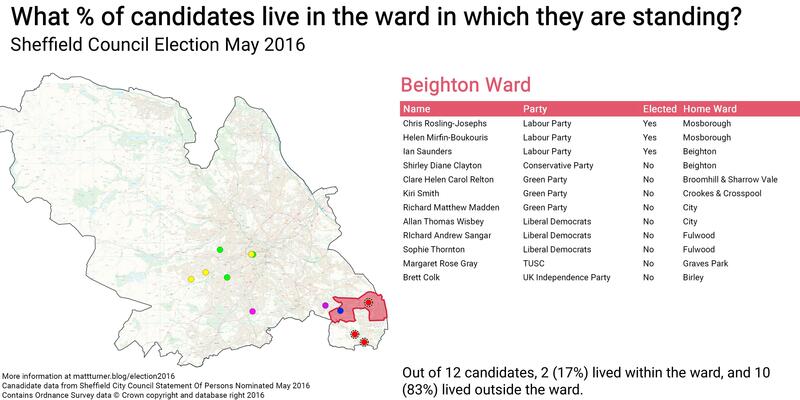 Some wards were home to a significant number of candidates. 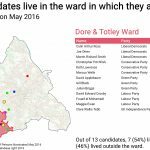 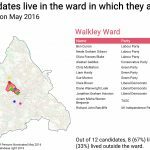 Walkley and ‘Dore and Totley’ wards were each home to 27 candidates, some parts of the city are home to many more political candidates than others. 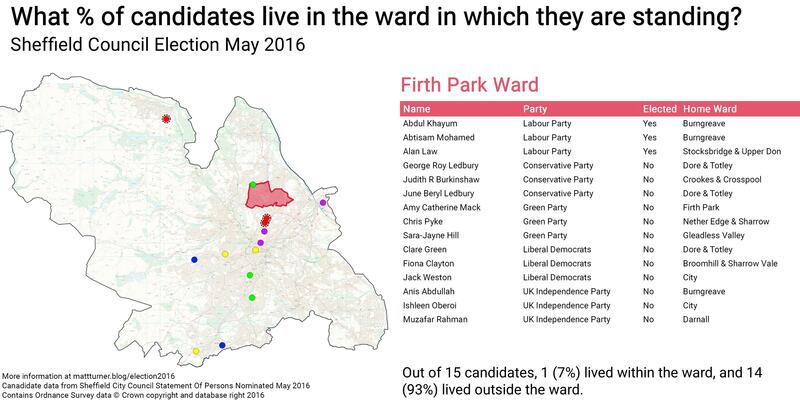 Interestingly, 8 candidates lived in Firth Park Ward, even though 13 of the 14 candidates standing in that ward lived outside the area. 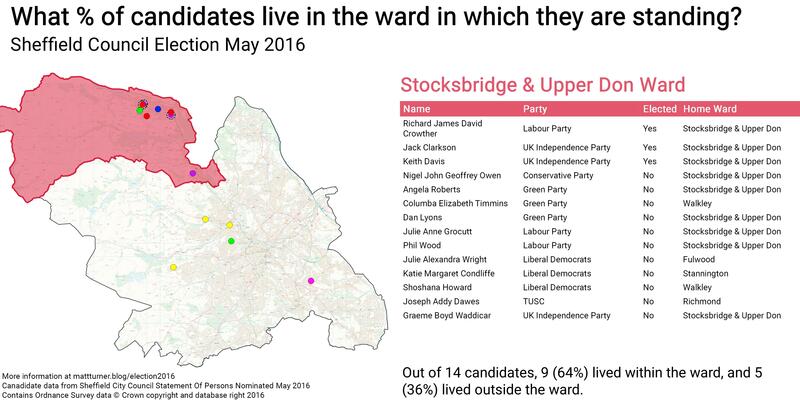 How does this vary across the political parties? 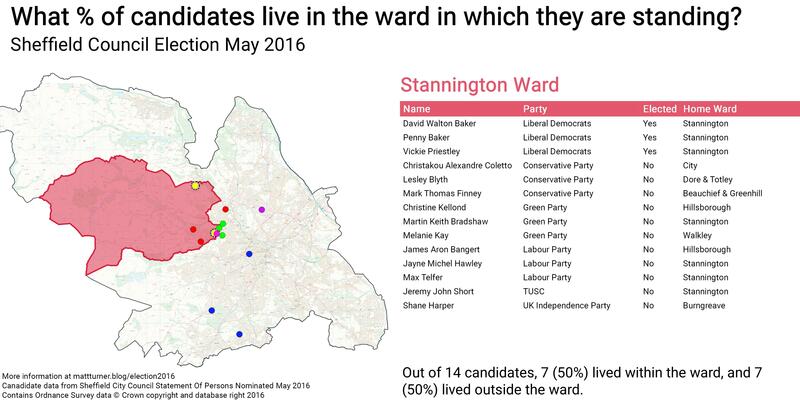 UKIP had 45% of candidates living in the ward where they’re standing (above the citywide average of 36%) but the Conservatives had only 26% of candidates living in the ward where they’re standing (below the citywide average of 36%). 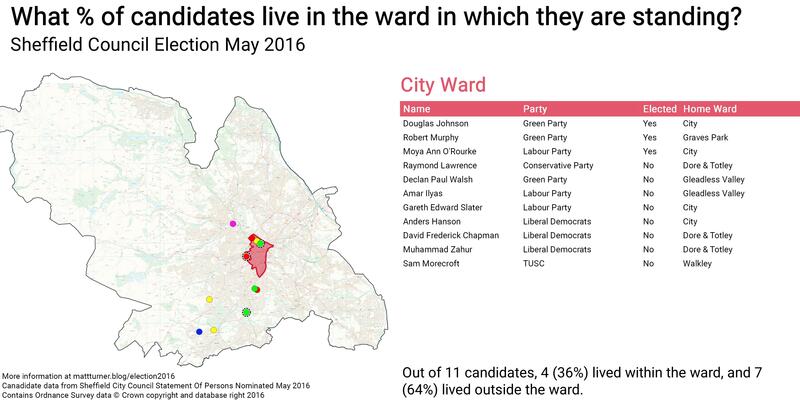 Overall, Conservatives, TUSC and Liberal Democrats are below the citywide average, and Labour, Green and UKIP are above the citywide average. 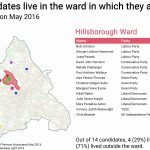 This entry was posted in elections on February 28, 2018 by Matt. 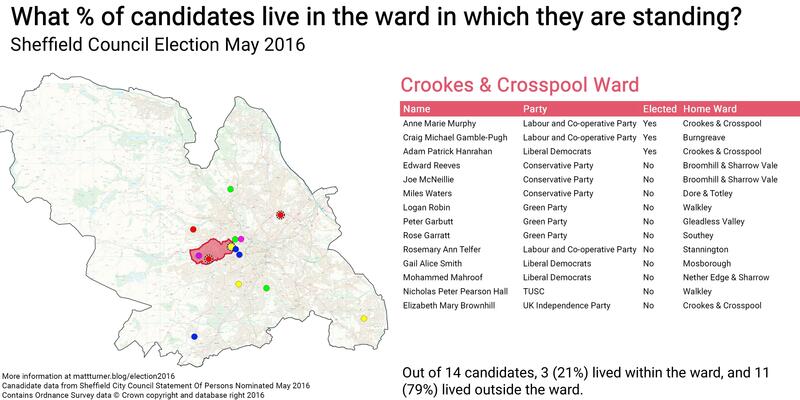 It’s difficult using all-up elections as all parties are scraping around to find as many candidates as they can. 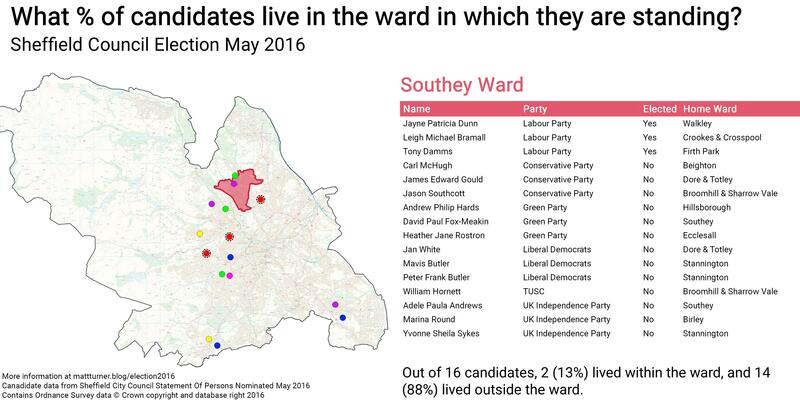 And also, after a boundary review quite a few people will find the boundaries moving under their feet. 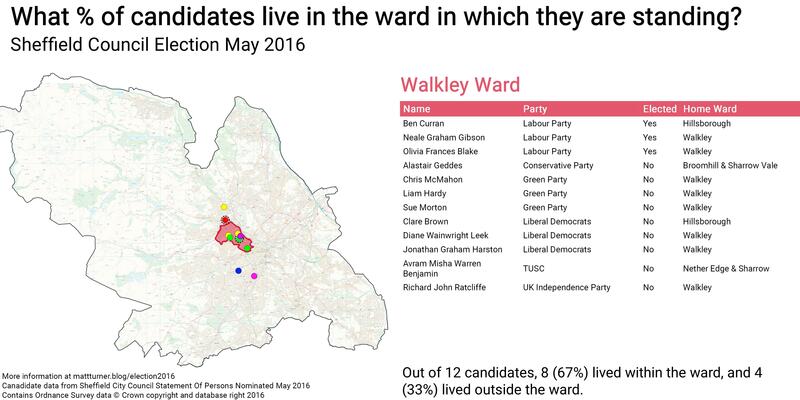 And you could “live” in an area without actually being in the arbitary electoral boundary for an area. 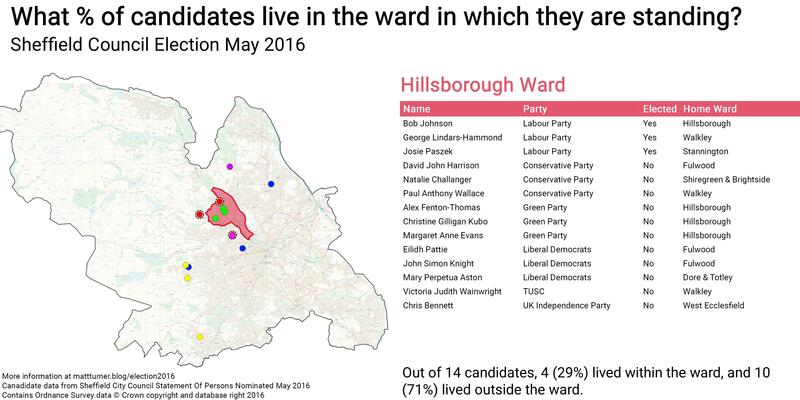 I knew a councillor for Hillsborough who lived right in the middle of what any sane person would agree was Hillsborough, but the actual ward boundary was the other end of the road.